The foundation for The Thoughtful House was poured this month by a congenial and efficient crew from Associated Concrete Services. Like most new homes, The Thoughtful House has a reinforced concrete foundation. Over a period of several days, the subcontractor's crew set up wooden forms, installed steel reinforcing bars (rebar) between the form faces, and then filled the forms with poured concrete from huge concrete mixers. Once the concrete set, within a few hours, the forms were removed. The next step was the plumber putting in pipes before the pouring of the concrete slabs. The thoughtful house has two kinds of foundations - a basement over the main part of the house and slab-on grade over parts on two sides of it. 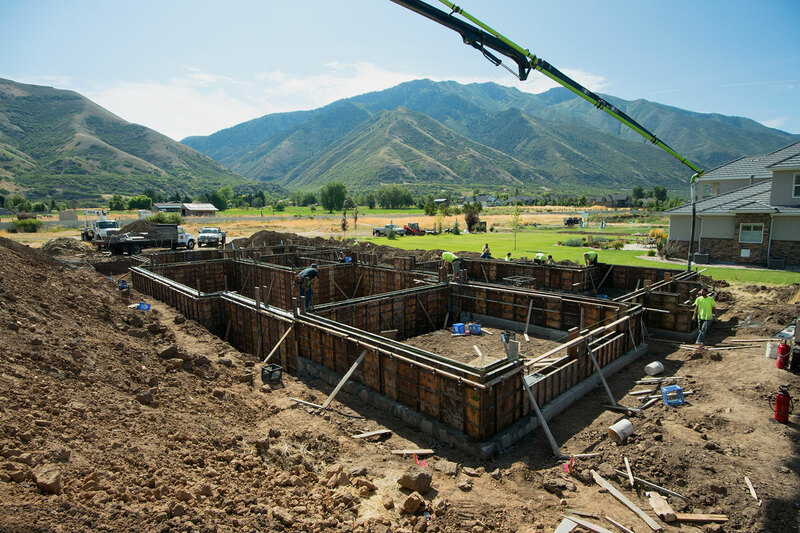 In Utah, where The Thoughtful House is located, a short foundation wall was poured on footings placed below the frost line. The foundation walls and footing are designed to work together to support the home's weight and transfer it to the surrounding ground. Because concrete is not waterproof, a waterproofing coating was brushed on the outside of the basement walls after they dried. The best way to protect yourself from problems with your new home's foundation is to hire an established builder with a good, long-standing reputation for quality work. Kelly Adams of A2Z Construction, the general contractor for The Thoughtful House, has been in the business for decades and has built many residential and commercial buildings. He was recommended to us by architects, banks and subcontractors who had worked for him.